The national Human Papillomavirus (HPV) vaccination program began in 2007 to protect females against HPV infections that can lead to cancer and disease later in life. Studies have since shown a substantial drop in HPV-related infection among the vaccinated group. 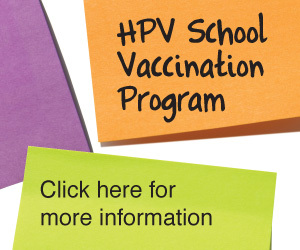 The free HPV vaccine is available to males and females aged 12-13 years in schools. Males aged 14-15 years are also able to get the vaccine at school in 2014. Parents or guardians are required to complete a consent form and return it to their child’s school to participate in the program. Once a child’s parent or guardian has consented, the vaccine is given as three injections over a period of six months by qualified immunisation providers. It is important to complete the full course – all three doses – for the best protection.